What makes a Philippines beach resort so unique that it continues to lure tourists from around the world all year round? The answer lies in the beauty of the beaches especially during the scorching heat of the summer season. The hospitality of the local residents makes the tourists feel that they are welcome, promoting a friendly environment. With the presence of coral reefs and other marine animals existing near the beaches, one may enjoy the pleasures of diving and snorkeling. After a day’s dip in the blue crystal water, night life consists of bars that offer alcoholic beverages that makes a vacation so exciting with families and friends. Philippines beach resort accommodations are affordable. Furnished by fully-air-conditioned rooms, king-sized beds, Jacuzzi, spa and cable-connected television sets, staying near the beache is a great pleasure. During the rainy season, gusty winds and huge waves attract foreigners who love to take up surfing. They are the ones who take delight in the crest of rolling waves. Thus the Philippines is no different from Hawaii, which is the haven for surfers. With the great number of local and foreign tourists flocking to the beaches every year, it is the responsibility of the government to preserve and maintain these beaches. The environmentalists in the Philippines act as a watchdog so that beaches can be constantly monitored for any degradation that may occur. The beauty of the beaches is also attributed to the presence of coral reefs that provide sanctuary for fish and other forms of marine life. If you are looking for a nice sunny place to take your vacation then you definitely have to consider going to a Philippines beach resort. The Philippines is located in South-East Asia and is one of the greatest tourist destinations in the area when it comes to tropical beaches. 10. Siargao Island - This teardrop shaped island is located 800 kilometers southeast of Manila. It is considered to be the Surfing Capital of Asia and of the Philippines. Its proximity to the Philippine Deep and coupled by the waves of the Pacific has made Siargao island a popular venue for surfers. Watch for local and international surfing competitions throughout the year. This location is great for adventure seekers. 9. 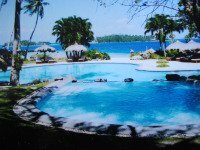 Pearl Farm Resort - The Pearl Farm Philippines beach resort is one of the best resorts located in Davao, situated in the southern part of the Philippines. The place used to be a pearl farm where they cultivated pearls but they have now transformed it into a resort for everyone to enjoy. 8. El Nido - Considered to be the country's final fronteir, El nido is located in Palawan (island of the gods). This place offers great beaches at the same time takes you away from the hustle and bustle of Urban life. Aside from its magnificent beaches El nido offers its visitors breathtaking sights of beautiful seacapes, towering marble cliffs and diverse wildlife. 7. Honda Bay - a series of islands that surround the capital of the southwestern province of Palawan. Visitors can enjoy a series of different activities from island hopping to diving, and experience the cool waters of Honda Bay. 6. Dakak - is a private Philippines beach resort that is about 750 meters long. Dakak Beach Resort is located near the provinces of Cebu and Dumaguete. It is situated in the city of Dapitan, exactly 15 minutes away from Jose Rizal's (Philippine National hero) place of exile. Natural spring waters from waterfalls supplies water to the pools of the resort. To reach Dakak, Dipolog city will be the point of entry and a must try restaurant called KenDoughMagic Kaffei is located in this city. Many foreigners frequent this place because of the quality food and service. 5. Camiguin - The place has been affectionately called by some as the "Garden of Eden" in the Philippines. This pear shaped island is located off the coast of Misamis Oriental in northern Mindanao. It has great topography that will really lure you to come back again. 4. Panglao Island - also known as the "little paradise of pure hearts", it is located near the island of Bohol. The small island is known for its peaceful beach resorts and a variety of dive sites. One of the best destinations for divers in the Philippines. 3. Mactan Island - The "Queen City of the South", Cebu city, has its fair share of beautiful beaches and historical landmarks. It is a tropical island and Philippines beach resort area where there are a lot of activities to do and enjoy. 2. Pagudpud - If you are looking for a place that you might compare to Hawaii then Pagudpud is the place for you. This secluded beach has long continuous white sands and inviting beachwaters. Very good place for long romantic walks on the beach. 1. Boracay - is the destination of choice for most locals and foreigners alike. The white sands and the cool waters of Boracay are the backdrop to the hippest parties and events. They party the night away with great music and drinks coupled with a mix of fun-loving people. 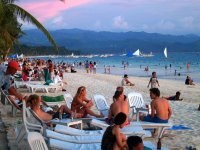 Tourists flock to the beach of Boracay the whole year round. It has become the most popular beach in the Philippines. So if you are looking for that great sunny getaway then look no further. A Philippines beach resort caters to everyone. We have beaches for surfers, divers, party goers, for families and couples who just want to spend a quiet time at the beach. Take your pick and visit Philippines today!